With 90% of participants claiming that positive online reviews influence their buying decision, and 86% said their decision was influenced by negative reviews according to a 2016 survey done by Zendesk, Google Reviews can shape your business far more than you might expect. We are going to share with you some creative ways that your dealership can get love letters (reviews) from customers. According to BrandWatch.com, “[with] over 89.3% of all internet searches being carried out by Google”, we suggest that your dealership invest their review requesting culture be geared towards Google Reviews. “[This is] a new era of marketing and service in which your brand is defined by those who experience it,” says social media expert Brian Solis. Maybe your dealership has some reviews already, maybe they don’t. One thing we can all agree on, is that when a potential customer searches for your dealership on Google, your reviews will come up. As an example, I Googled Google (always wanted to say that). 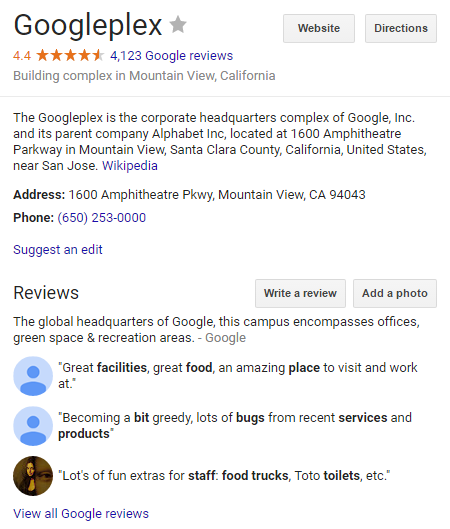 More specifically, the Mountain View, CA location, in order to show that when you search for a business’s location in the world’s most popular search engine (according to Search Engine Watch 2016), you will indeed see that business’s reviews; the good ones and the bad ones. If you have some reviews and they’re not the best, we suggest not focusing on combating the few negative ones and work towards loading up on new rave reviews. Having negative reviews should motivate you to go out and seek positive ones to push the negative ones down the list. That is not to say that you should ignore the negative ones. Google Reviews allows the owner of the verified Google Review page to respond to comments left under the reviews section. We highly encourage that your dealership respond to reviews, making your dealership look more favorable to those who might want an explanation for a review. The goal with a reply to a customer is simple; listen to their concerns, and do your best to turn their experience around and brighten their perspective and satisfaction. The overarching goal is to encourage your happy customers to take a few moments of their time to write about their experiences on your dealership Google Reviews page. The good testimonials will ultimately influence the potential customers who are reading about previous customer experiences. Be nice and don’t get personal. It’s difficult to win an argument with a frustrated customer and a Google Review is not the place to burn a bridge. Keep your response useful, readable and courteous. Keep it short and sweet. Users are looking for useful and genuine responses. Do not overwhelm a customer with a lengthy response. Call them if you have more to say. Thank your reviewers! We’ve already said it, but you should be responding to positive and negative reviews. Be a friend. You are not always a salesperson. This is a good place to be humble with your customers. Diffuse an angry situation by offering / arranging a personal phone call with a person of authority at your dealership. Give that person the opportunity to share their story offline, potentially righting a wrong. If you’d like to learn more about internetiquette (internet etiquette) – the guidelines and rules for responding online and how to direct a conversation with a customer offline, click here. One of the biggest remarks we hear from customers is how there is no incentive behind the customer taking the time to complete a survey for a dealership. After a customer purchases a piece of inventory, most customers don’t even know what dealerships do with those surveys. Most dealerships are intimately aware of CSI (Customer Satisfaction Index) and manage their customer satisfaction from surveys that are sent out after a deal has been closed. Often times, a customer is only reached out to if that dealership receives anything but a high score (ie. ratings any less than 10’s are cause for salesperson point deductions and possibly even being let go!!). It is widely noted from previous dealership sales representatives that many dealerships don’t take the time to truly listen to WHY they might have less than a 10 on the CSI. We suggest calling your customers and personally asking for those Google Reviews. Take the time to listen and the benefits will be reaped by showing that you care about improving the dealership experience for that customer and all customers in the future. Include asking for a Google Review as part of your customer satisfaction follow-up. Ensure that you get the customers email address and send them a personalized email with your Google Review link. Don’t forget to thank them for their business and their time. Keep in mind, the average customer is not going to go out of their way to leave your company a review on Google unless you ask for it. Put direct links to your review profile in multiple places; for example, in your email signature, in your digital marketing material, on your website and on your Facebook page. Additionally, if your dealership budget permits, consider having mugs designed and mailed out with your dealership logo and a reminder that they purchased from you. Everyone can use a new mug for their favorite tea or coffee! 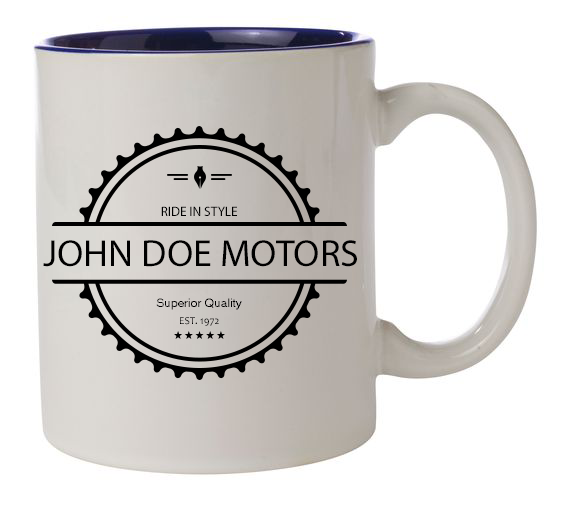 You can include something witty on the mug like, “Coffee is for people who buy from John Doe Motors!”, “#JohnDoeMotors”, “I ride in style with my John Doe Motors vehicle.”, etc. Let them know that you look forward to helping them with their next purchasing decision at any point in the future. These are all special touches that set your dealership and salespeople apart from the rest. We’re certain that your customers will love you for that. If your dealership has any questions regarding this process, please reach out to our dealership industry professionals and they will be happy to share with you some best practices for managing your dealership presence on social media. Contact hello@lotvantage.com for more information.